The perfect feature for every rack has now arrived with the Gator Powered Rack! 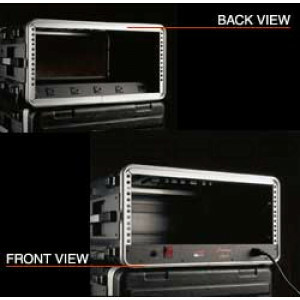 This revolutionary rack contains everything you need for your rackable gear. A built-in power distribution center provides 5 power sources, 15 amp push to reset circuit breaker, and front panel on/off control with pilot light. In addition, it has surge protection to keep your gear safe against power spikes! The power unit is mounted under the rack rail and does not use up a rack space like other power distribution units. Like other Gator racks, these also have threaded rails and locking covers. The best part is that this unit is put into our roller rack. Thus giving you a rack with wheels, pull out handle, lightweight, super durability and power! This is the Swiss Army knife of Racks.